WASHINGTON (Sputnik) - Russia has been insisting on making the Intermediate Nuclear Forces (INF) Treaty multilateral to include NATO countries as the agreement safeguards Europe and does not concern the security of the United States, Russian Ambassador to the United States Anatoly Antonov told reporters. The Russian ambassador spoke to reporters at a Global Peacemaker Awards Event in Washington organized by The Sustained Dialogue Institute (SDI) with the support of Susan Carmel, chair of the American-Russian Cultural Cooperation Foundation. Russian saxophone virtuoso Igor Butman and US nine-time Grammy winner Wynton Marsalis won this year awards for strengthening cultural ties between Russia and the United States. "We first addressed it to the countries of NATO and, of course, to France and the UK. These are nuclear states. We said that it would be great if they joined this conversation. However, back then we were told that no one had such missiles and that they would not need to join. We were refused. Unfortunately, our efforts did not succeed," Antonov said. The diplomat noted that this idea is not new, but some 10 years old. "Russia has been and is in favor of making this treaty multilateral. To ensure that not only the People's Republic of China would enter it, but that all NATO states and, primarily, France and the United Kingdom, should be part of it," Antonov explained. 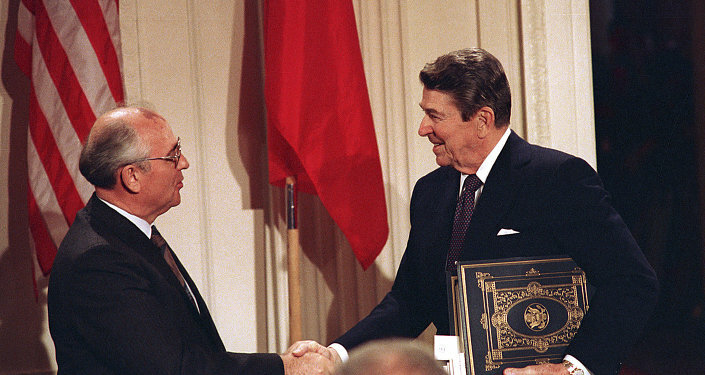 Washington has still not given notice to Moscow about its intentions to leave the Intermediate Nuclear Forces (INF) Treaty, he added. "The United States still has not given us any notice, required in accordance with the provisions of the INF, of their intention to withdraw from the treaty… As I understand, the United States is continuing consultations with its allies on the issue. We have already heard the concerns of European countries regarding a possible pullout of the United States from the INF," Antonov said. The diplomat pointed out that a sensitive issue for Russia is under what circumstances and if the United States considers deploying medium and short-range missiles in Europe. "For us it is not just a challenge; for us, it will be a national security threat. It is very serious… Therefore, we consider it important and necessary to sit at the negotiating table with the United States and we have repeatedly spoken about this. We believe that if there is political will, then any problem can be solved," Antonov underlined. On October 20, US President Donald Trump announced that the United States would withdraw from the INF, claiming that Moscow was not respecting the agreement. "As for other sanctions, after November 6, we need to wait a bit and see what decisions will be made. Unfortunately, there is conflicting information as to what can be expected about the set of possible sanctions," Antonov said. The Russian ambassador noted, however, that surprises related to anti-Russia sanctions were still possible. "We hear that the administration has already completed the maximum of opportunities, but surprises are possible. I just want to say — and we have repeatedly spoken about this at various levels — that it will not be possible to establish good relations with Russia by sanctions," the ambassador added. The United States imposed sanctions on Russia in August over its alleged use of a nerve agent in an attack on former Russian spy Sergei Skripal in the UK town of Salisbury. Moscow has categorically denied all the allegations, with Russian Foreign Minister Sergei Lavrov saying that the Skripal affair was falling apart due to the lack of evidence proving Russia's involvement. The Russian Foreign Ministry said that it had sent about 60 diplomatic notes to the UK Foreign Office demanding that Russia be given access to the investigation, as well as offering cooperation, but to no avail. Russia has been given until November to prove that it is complying with international rules on chemical weapons and to allow inspections, or face a new round of even more severe sanctions. "We will work with the people that the American people elect," Antonov stated. On November 6, US voters will cast ballots in the midterm elections to fill the 435 seats in the US House of Representatives, one-third of the 100-member Senate, and a number of local and statewide positions, including governorships. All three major groups of voters — Republicans, independents and Democrats — are showing record enthusiasm for voting this year compared with the 1994-2014 trend, potentially reflecting a more highly charged political atmosphere than in the past, according to a Gallup poll published on Thursday. The outcome will determine whether the Republican Party retains control of Congress. The midterm elections are often regarded as a referendum on the president’s performance.